So the first thing you want to do is take out you meat and let it sit for about a half hour to get it to room temperature. While you are waiting for your meat to become room temperature chop up your garlic and slice your lemon. Once meat had been brought to room temperature, cut it to desired pieces to fit pan. Then season both sides with salt and pepper. With a cast iron skillet, heat about 1-2 Tbsp of Olive oil. Heat the oil until you see it looking like its swirling. Once pan is nice and hot, add your steak. Be careful it should start sizzling right away and oil can splat up. Let the steak cook for about 3 minutes before flipping. After 3 minutes, flip your steak and add about 2 Tbsp of butter, a sprig of thyme, and about a clove of chopped garlic. Lean the pan and create a pool of butter and with a spoon carefully spoon the garlic butter on to the steak for another 3-5 minutes (medium-rare to medium) or cook longer depending on how well you like your steak cooked. Check with a meat thermometer or simply slice into the steak to check its doneness. Once done, remove from skillet. *Note: You can under cook the way you like your steak by a minute or so and leave it in the cast iron and remove from heat. The pan will still be hot and keep cooking your steak while you make your scallops. The next step is to cook our scallops and we are using the same technique as the steak. So first season your scallops with salt and pepper as well as heat skillet and oil until its hot and oil looks like its swirling. We want it nice and hot so when the scallops touch the pan it starts to sizzle right away. Once the pan is hot go ahead and add your scallops, once again being careful not to splat up the hot oil. I used tongs to place scallops in pan to be safe. Sear your scallops for 3 minutes. Flip your scallops with tongs and do the same thing as you did with the steak. Add butter and thyme (I did not add garlic). Make a butter pool and spoon butter onto scallops for another 3 minutes. Plate with steak and serve immediately with a lemon wedge. For extra butter save your brown butter sauce from pan. I really enjoyed this meal (and so did everyone else I served it to!) I loved how fresh and high quality my ingredients were, I can't wait to go back so I can create another fantastic meal! Set meat out for about a half hour to bring to room temperature. Slice meat into desired lengths to fit in pan. Season with salt and pepper. Heat a cast iron skillet with about 2 Tbsp of olive oil until it is hot and oil looks like it is swirling. Carefully add your steak to skillet. (It should start sizzling right away.) Cook for about 3 minutes then flip. 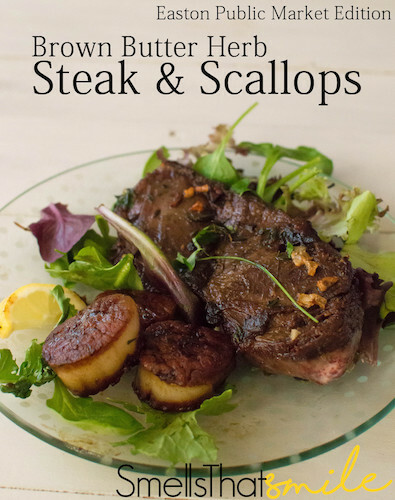 Create a pool of butter by tilting pan and spoon garlic butter on the steak continuously for another 3-5 minutes. Check with a meat thermometer or by cutting into steak to view for your preferred doneness. Set aside. Do not leave in cast iron or else it will still cook so I recommend either plating it or undercook steak by a minute and remove pan from heat. Steak will finish cooking while in hot pan. Using the same technique as the steak, season the scallops with salt and pepper and heat skillet with about 2 Tbsp of olive oil. Let pan heat up and the oil looks like it’s swirling. Pan should be hot enough the scallops will sizzle. Add Scallops, cook for 3 minutes then flip. After you flip scallops (same as steak), add about 2 Tbsp of butter and a sprig of thyme. Create a pool of butter by tilting pan and spoon butter on to the scallops continuously for about 3 minutes. Plate Scallops with Steak and serve immediately with a lemon wedge. For extra butter, discard the thyme sprig and save your brown butter sauce.